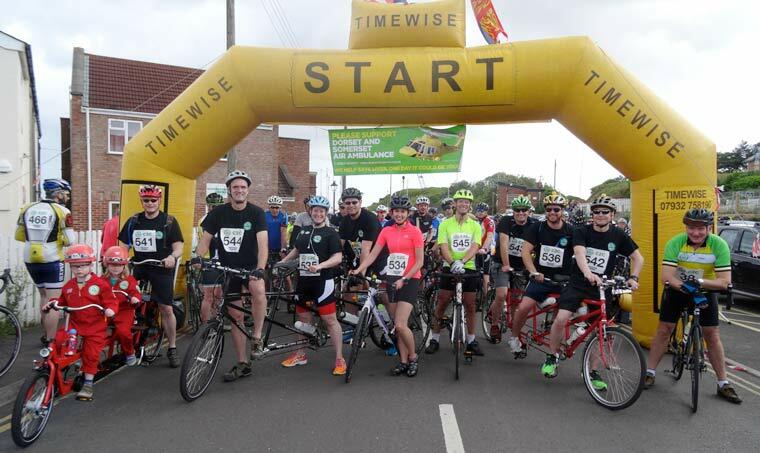 Hundreds of cyclists assembled at Watchet Harbour on the Somerset coast to take part in the 7th annual Dorset and Somerset Air Ambulance Coast to Coast (C2C) Cycle Challenge on Sunday 14 May. The 7th annual Dorset and Somerset Air Ambulance Coast to Coast got off to a flying start on 14 May. The event, which is not a race, saw 580 cyclists turn out, in what has become an annual spectacular. The gruelling but glorious 54 mile ride to West Bay in Dorset attracted 564 cyclists with a further 16 completing the shorter 11-mile route which began at Drimpton and also ended at West Bay. This year, for the first time, the cyclists were joined by members of the Dorset and Somerset Air Ambulance crew, Coastbusters, who also took part. It wasn’t long before Watchet town crier David Milton, ramped up the proceedings and began the official countdown to set the cyclists on their way. The first female to arrive at West Bay was Kate Cadbury. Cycling with her husband Thomas, the pair were joined by their five year old son Joshua as they approached the finish line. At 79, Brian Pursall was once again the oldest participant of the day. He took part for the third time and cycled the full 54 miles. Freya Williams was the first child who cycled the 11 mile route to arrive at West Bay, closely followed by the youngest individual participant Olivia Reid (aged 11), who took part on the bike that she won last year when she raised the most sponsorship in the Under 16 category. Of those taking part, there were former patients who had experienced the work of the air ambulance first-hand. Others cycled in memory of loved ones, as part of a team, or simply as a personal challenge to show their support for the life-saving charity. Last year, the Coast to Coast Cycle Challenge raised over £81,000 (including gift aid). Prizes will be awarded to those who raise the most in sponsorship in the following categories: Adult, Under 16 and Team. These will be presented later in the year when all funds are received. Closing date for sponsorship is 1 August 2017.